I was awake and just logging into my laptop, still in bed, when I first felt some movement. The movement was slight and not impulsive, so I thought it was a small earthquake. Then the shaking reappeared. This is when I started counting. one one-thousand, two one-thousand…. twenty one-thousand. The S-Wave lasted about 20 seconds. I thought back to the 2010 earthquake that lasted about that long and it was a M 6.5 earthquake. SO, I immediately thought this was probably a mid M 6 earthquake. However, the shaking was subdued. So, it could be a larger earthquake further away. I logged into social media and people were already contacting me. A friend felt it shake for 2 minutes in southern Oregon (so I thought it might be a large earthquake on the Blanco fracture zone, especially since there were a couple up there recently). 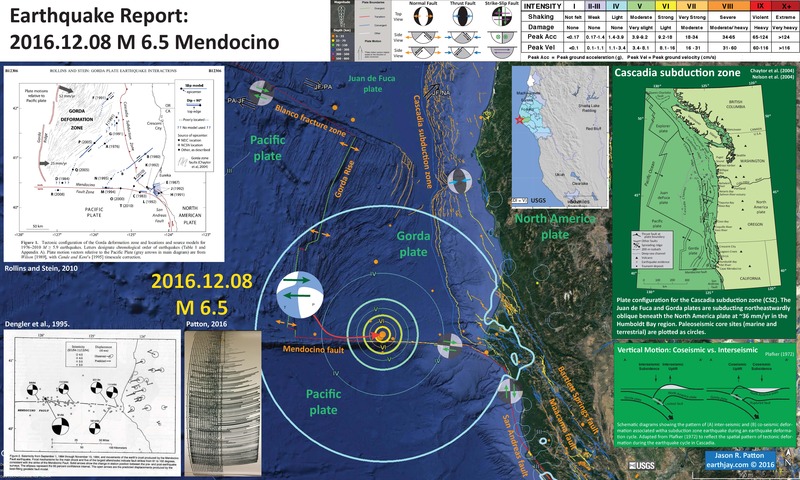 I checked the USGS website here and saw that it was closer to me (Manila, CA), along the Mendocino fault. At first it was a M 6.8, but the location and magnitude changed to an M 6.5. This is a preliminary report and I hope to prepare some updates as I collect more information. In the lower left corner is a figure from Dengler et al. 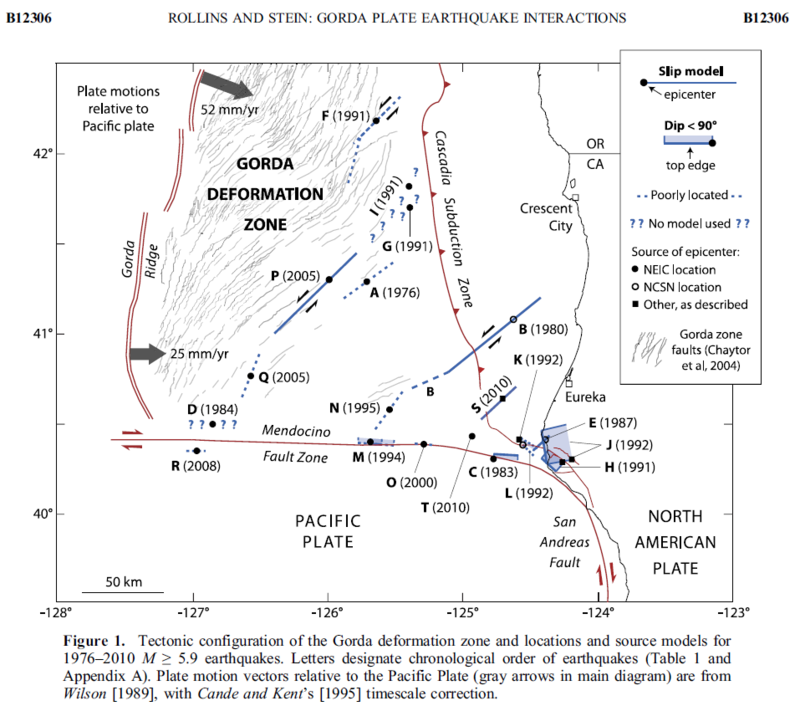 (1995) that shows focal mechanisms from earthquakes in this region, along the Mendocino fault. 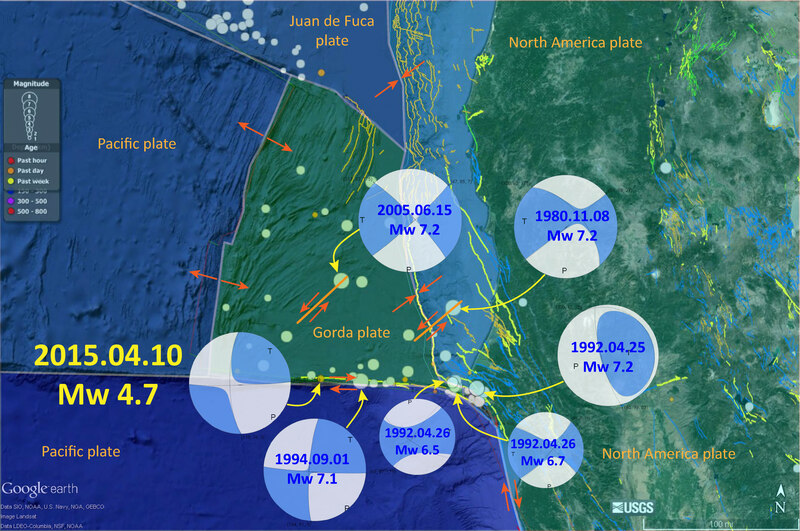 Today’s earthquake is near the 1994 earthquake. To the right of the Dengler et al. (1995) figure, I present a photo I took of the seismograph observed in Van Matre Hall on the Humboldt State University campus. This seismograph is operated by the HSU Department of Geology. In the upper left corner is a figure from Rollins and Stein (2010). In their paper they discuss how static coulomb stress changes from earthquakes may impart (or remove) stress from adjacent crust/faults.